It was an incredible day of action as the Grand Finals matches were confirmed after some brilliant hockey, and big results, in the play-offs. Victories in today`s men’s play-offs for Grange and Grove Menzieshill has ensured that both clubs will contest European competition next season, all that still has to be decided is who will occupy the number one slot. In the women`s competition league winners Edinburgh University will still be in Europe next season despite losing 1-0 to Western Wildcats. As a result the top European spot will be decided by next weekend`s final between Wildcats, their first ever Grand Finals appearance in a European Grand Finals match, and Clydesdale Western, the latter saw off Dundee Wanderers 5-3 in a goal feast at Titwood. After a goalless first 20 minutes Grange men took the lead with a penalty corner conversion by Frank Ryan. The same player added a second several minutes later after Dylan Bean had created the opening with a good move up the left. The chance of an Uddingston comeback emerged at the start of the second half when Ben Ferguson found the net with a rebound strike at a set piece. But within a couple of minutes Dan Coultas restored Grange`s two goal advantage after Robbie Shepherdson had created the opening. Todd Mills put the icing on the cake with a fourth following good play down the right by Duncan Riddell and James Nairn. Grove Menzieshill will be the other finalists in the men’s competition after a 3-2 win over Western Wildcats, the catalyst was a last minute winner from Cameron Golden just coming back from injury. Chris Moon`s first time shot put Grove Menzieshill ahead but Rob Harwood levelled for Western Wildcats following a scramble in the circle. A breakaway strike from Fraser Moran gave Western Wildcats a 2-1 lead in the second half, but back came the Dundonians with a strike from Ben Cosgrove. The tie hung in the balance until Golden coolly picked his spot before putting the ball to the keeper`s left for the winner and a place in Europe. In the women’s play offs, league champions Edinburgh University were the victims of a big 1-0 reversal at the hands of fourth placed Western Wildcats. It was an even first half where both sides created good chances. The game’s only goal came from a penalty conversion by McKenzie Bell ten minutes into the second half, and it prompted her side to kick on and take control from there. Both goalkeepers, Jayne McLaughlin and Katie Goddard, had tremendous matches and kept the game close with top quality saves. Uni went to kicking back as the game came to a close but Wildcats held on for the win. It was a sensational victory for Western Wildcats and will see them take to the pitch at the Glasgow National Hockey Centre for the first time competing in a Grand Finals contest. The team will be without doubt full of confidence after the victory and the scene is set for a huge women’s final showdown. But who would they be up against? The other tie was an eight goal thriller with Clydesdale Western emerging 5-3 winners over Dundee Wanderers. The Titwood-based side went three up at the interval, Naomi Harkness, Emma McGregor and Fran Lonergan were on target, while Charlotte Watson from the spot got the Wanderers goal. Sophia Free and Watson again brought the score back to 3-3 only for Harkness, scoring again, and Ali Eadie striking from the spot to secure the victory for Clydesdale Western. The Grand Final is set to be an absolute cracker with both sides on top form. In the men`s relegation play-offs both Hillhead and Kelburne retained their top flight status. Graeme Campbell was the catalyst with two goals in Hillhead`s 3-1 win over National League 2’s Dunfermline Carnegie, the first came from a close range shot followed by a reverse stick effort that found the bottom corner of the net. Jude Boselem added a third with a reverse stick shot into the roof of the net. Dunfermline finally scored at a counter-attack, but it proved little more than a consolation. Kelburne went to Watsonians and came away with a 2-1 victory, Gary Maitles and Miles Goldie scored for the Paisley outfit, Andrew Fraser-Harris replied for the home side. GHK retained their National League 1 status with a single goal victory over Glasgow University. GHK bossed the first half but came up against a well organised and impeccable defence. Connie Lathe came close for Glasgow Uni but Ali Westwood was comfortable in goal for GHK. In the second half the impressive Lynsey Waddell and Susan McGilveray were both unlucky to not open the scoring after being denied by some top class saves, as they pressed for a goal. In an absolute nail-biter of a finish, with running penalties looming, Carly Bisset scored the winner with just 20 seconds remaining to grab a sensational victory and retain National League 1 hockey for GHK next season. Hillhead did the same with a 2-1 win over National League 2 Erskine Stewarts Melville. 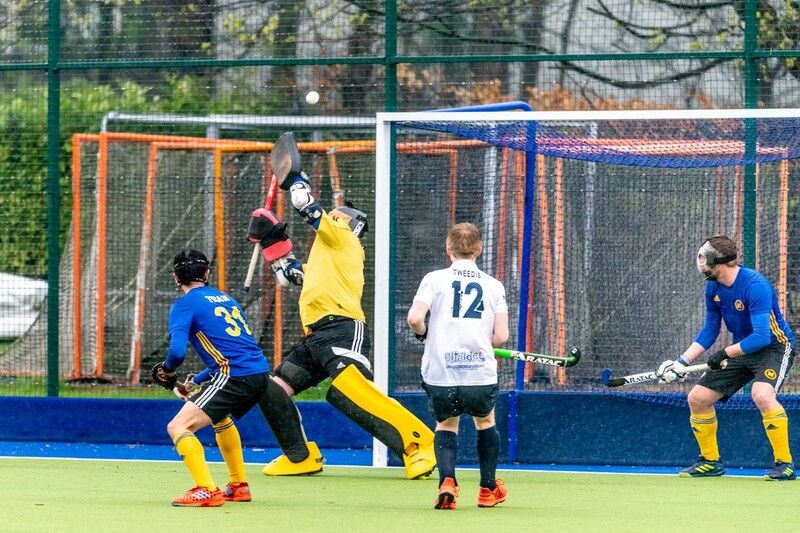 This sets up a massive relegation clash between Glasgow University and Erskine Stewarts Melville next weekend in what is sure to be a tasty contest at the Glasgow National Hockey Centre.